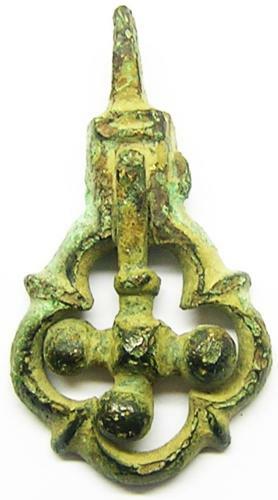 This is a wonderful medieval bronze horse harness pendant, dating to the 13th - 14th century. It is decorated with a swinging cross, within a quatrefoil frame. Such a pendant would have been attached to the elaborate leather harness, of a knightly steed. PROVENANCE: Originally found in Exeter, Ex. Gloucester Collection.